Central Park  is a large park in New York City, forming a vast green swathe of open space in Uptown Manhattan and a district in its own right, neatly separating the Upper East Side from the Upper West Side, whilst lying south of Harlem. It covers 843 acres (1 E6 m² or 3.4 km²), in the shape of a rectangle 2.5 miles by one-half mile (4 km × 800 m) in the central part of Manhattan Island and represents a convenient oasis for New Yorkers escaping from their skyscrapers. Central Park is well-known globally after its appearance in many movies and television shows, making it one of the most famous city parks in the world. Central Park is bordered on the north by Central Park N (110th St), on the east by Fifth Ave, on the south by Columbus Cir and Central Park S (59th St), and on the west by Central Park W (Eighth Ave, or Frederick Douglass Blvd north of Central Park). In the 1850s, realizing the need for a large public green space for New Yorkers to get away from the chaos and noise of the city, the New York legislature set aside a vast swath of land in Upper Manhattan. Landscape designers Frederick Law Olmsted and Calvert Vaux developed the winning design for the park, influenced by naturalistic landscapes which were popular in park design at the time. Any architectural features and roads were to be visually integrated into the surrounding landscape, to maintain the "rustic" feel of the park. The park was officially completed in 1873, with more than 500,000 cubic feet of topsoil brought in from New Jersey and millions of trees, shrubs, and other plants laying the foundation of the park. Through the early 20th century the park fell into a decline due to a lack of maintenance, with dead trees, worn-out lawns, and much litter and vandalism. The park received a major boost in the 1930s, when these issues were finally addressed, but the park once again fell into a decline in the late 20th century, becoming increasingly run-down and crime-ridden through the 1960s and 70s. In 1980, the Central Park Conservancy was founded under contract from the city to restore and maintain the park. Today, the violent night crimes of previous decades are all but gone, and common sense is all you really need to stay safe in the park today. Central Park exists because some wealthy and powerful people, living in New York in the mid-1800s, wanted a place where they could stroll, ride their carriages and enjoy the country without actually having to leave the city. So, in 1853, New York City was authorized to purchase more than 700 acres of land between 59th and 106th streets and 5th and 8th avenues. The land featured swamps, uneven terrain, and the occasional rocky outcrop. Before beginning construction, the city had to evict over 1,600 impoverished residents living in shanties and eking out a living on those same acres. Not long after, the park evicted the residents (and took possession) of Seneca Village, one of the most prominent African-American settlements in New York. Having finally removed the pesky human inhabitants from the future park’s site, the city turned its attention (ironically) to creating an urban oasis that would be open to all and sundry. In 1857, a landscape design competition was launched. The winners, landscape architect Frederick Law Olmsted and architect Calvert Vaux, were responsible for the design and creation of the park. It took 20,000 workers 15 years to create Central Park. During those years, they planted over 270,000 trees and shrubs, moved three million cubic yards of soil, built paths, created elegant bridges and constructed buildings that still stand today. They also used more gunpowder than would be fired at the Battle of Gettysburg to blast away rocky ridges. The park opened to the public in 1873. Soon, it was playing host to more than seven million visitors a year (today it receives 42 million annual visitors). Initially, these were mostly upper-class visitors. Concerts were held on Saturday, a day not available for leisure for working citizens. Tradesmen were prohibited from using their wagons to take their families on drives through the park and boys could only play ball in the meadows if they had a note from their principal. Working-class New York soon rebelled against these stringent regulations. By the 1880’s concerts were being held on Sundays, bicycling (on the drives initially reserved for carriages) was allowed, and the famous carousel was built. The zoo, the park’s most popular attraction, was given a permanent park home. For the next 80 years, the park continued to evolve. Drives were modified to accommodate automobiles. Playgrounds were added. New buildings such as the boathouses and the Chess & Checkers House were constructed. The Wollman Rink was opened. In the 1960's, a lack of funds sent the park spiraling into decline. By the middle of the 1980's, it was covered with litter and graffiti. Structures were crumbling, and playgrounds were in disrepair. Once lush meadows were turning into dustbowls. Crime was rampant. Fortunately, two private advocacy groups merged in the late 1980s to form the Central Park Conservancy. 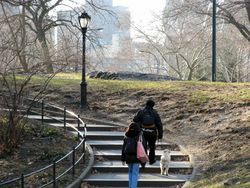 Their goal was to restore Central Park to its former glory. Thanks to the hard work of the Conservancy, and support from the City of New York, Central Park today has never looked better. A glimpse of wilderness in the heart of Manhattan, Central Park has captured the imagination of many an author. It’s frequently used as a metaphor for introspection, escapism and the possibility for the fantastic in daily life. While there aren’t many books set in their entirety within the park, it still makes an appearance in many New York novels. There are also non-fiction books that get into the history and development of the park and New Yorkers’ relationship with it. ’’The Catcher in the Rye’’ by ‘’’J.D. Salinger’’’ follows the protagonist Holden Caulfield experiencing isolation and alienation as he matures. The narrative leads Holden into Central Park during winter, where he reflects next to the lake. The lake’s ducks capture Holden’s imagination, leading him to wonder where they go in the winter. These youthful musings illustrate his curiosity for the world and the cyclical nature of life. The lake itself is a symbol of where Holden is in life; transitioning between frozen and thawed as Holden transitions from childhood to adulthood. ’’’Edith Wharton’’’ received the Pulitzer Prize in 1921 for ‘’The Age of Innocence’’, which follows a betrothed Manhattan couple in the late 19th century, and their precarious position in New York society. It was during the period that Wharton was writing that many of the mansions lining the park on the Upper East and West side were built, and some of them still remain today. The novel is lauded for its vivid descriptions of early 20th century New York. ’’’Prince of Central Park’’’ by ‘’Evan H. Rhodes’’ began as a novel but was later adapted into a musical by Rhodes himself, and then into a movie by ‘’John Leekley’’. The plot follows a twelve-year-old boy whose mother dies, leaving him in the care of an abusive foster mother. He runs away to live in Central Park where he meets a cast of remarkable characters. The original novel is less well known than the movie, and the musical’s run ended after only four performances. 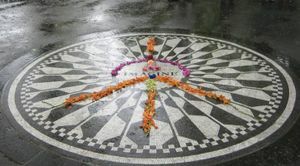 ’’’Central Park: An Anthology’’’ asked New York writers to reflect on what the park means and create pieces specific to it. Along with a dozen specially-commissioned stories, there’s a handful of classics about the park. For visitors who want a better understanding of the magic of the park and New Yorkers’ relationship with it, the anthology is filled with tributes to the park and the possibilities it holds. The French author ‘’Guillaume Musso’’ wrote the suspense ‘’’Central Park’’’ that opens with its main protagonists on one of the park’s infamous benches. With non-stop surprises and engaging characters, the novel is a wild ride that grips readers from the start. Central Park is accessible by subway, with the A, B, C, D, and 1 trains stopping at Columbus Cir (on the southwest corner of the park), and the B and C local trains continuing along Central Park W, with stops at 72nd St, 81st St (under the Natural History Museum on the Upper West Side), 86th St, 96th St, 103rd St, and 110 St. Somewhat further west, the 1 (local) and 2/3 (express) lines travel up Broadway, though that avenue angles further and further to the west northward from Columbus Cir. The 2/3 also stop at 110th St and Lenox Ave, near the northeast corner of the park. 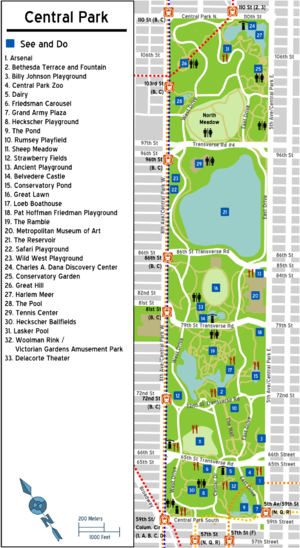 On the Upper East Side, the park can be accessed by taking the 4, 5, and 6 lines along Lexington Ave and walking 3 blocks west. There is also a stop on the N, Q and R lines at 5th Ave and 60th St, and a stop on the F train at 57th St and 6th Ave, both near the southern limits of the park. The park is crossed by several bus routes that travel east-west along the transverse roads (the M106, M96, M86, M79, M72, and M66, all with subway connections), as well as the M1, M2, M3, and M4 bus routes along 5th Ave/Madison Ave, and the M10 along Central Park W.
Central Park is 843 acres of urban oasis. It measures 2.5 miles long and 0.5 miles wide. It is open year-round, regardless of the weather, and closes only five hours a day (from 1am-6am). Meandering paths take visitors through meadows, up hills, around lakes and through forests. Cars are only allowed on designated drives, and only during select hours. Central Park, therefore, is best explored via any conveyance that does not require a motor. From gentle, paved loops to rigorous hiking trails, Central Park features paths and trails suitable for all ages and agility levels. Visitors are welcome to explore the park on their own, but numerous companies also offer self-guided and fully-guided walking tours. Central Park offers paved and dirt roads suitable for biking. Bicyclists who aren’t able to pack a bike in their luggage can find plenty of companies happy to rent everything from standard touring bikes to those with trailers that are perfect for hauling tired tots. Most of these same companies also offer guided bike tours of the park. Pedicab tours are perfect for people who prefer to let someone else do the pedaling. Pedicabs, also known as “bicycle rickshaws” were developed in Japan in 1870 and introduced to the United States in 1962. A pedicab is essentially a very large tricycle with a 2-seat passenger compartment (which is typically covered) and a separate seat up front for the driver who does the pedaling and steering. They are looked on as both a form of green transportation and a fun tourist attraction. While tours vary from company to company, they typically last one to two hours and cover approximately ¼ of the park. All tours visit some of the park’s famous attractions. Central Park has known the clip-clop of horses hooves practically since its inception.The park was originally created as a way to allow the wealthy to go for a drive in “the country” without having to actually leave the city. After suffering a decline with the advent of the automobile, horse and carriage rides reinvented themselves as a tourist attraction shortly after World War II. Today, horse-drawn carriages line Central Park South between 5th and 6th Avenues. A host of companies offer rides of varying lengths and different routes through the park. While visitors are welcome to simply walk up to the carriages and inquire if any are available for a drive, advance reservations are recommended. Almost all companies are happy to make advance arrangements for extras such as flowers, photography stops, or a stop at a given location for a marriage proposal. Regardless of the chosen method of exploration, a map of the park will come in handy. Visitors can pick up maps at any one of the park’s numerous visitor centers, or go to http://www.centralparknyc.org/maps/ to find links for downloading a map to a smartphone. Visitors can find jogging and biking trails as well as free self-guided walking tours. The South End runs from Central Park S to the Lake, just north of Terrace Dr (72nd St). The Great Lawn area runs from the Lake to the 86th St Transverse Rd. 1000 Fifth Ave (at 82nd St), ☎ +1-212-535-7710, . Tu–Th 9:30AM–5:30PM, F Sa 9:30AM–9PM, Su 9:30AM–5:30PM, closed M. $25, $17 seniors, $12 students, children under 12 free, includes same-day admission to the Met Breuer on the Upper East Side and to the Cloisters Museum & Gardens in Upper Manhattan. 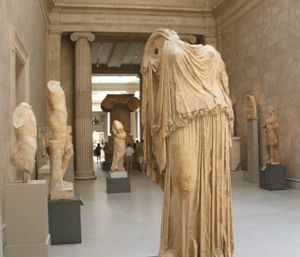 New York State residents as well as students from NJ and CT: pay what you wish..
One of the world's largest and most important museums of art and world culture, you'll have to devote several hours; nay, an entire day (if not more! ), if you want to do this place justice. This massive Gothic-style building, originally opened in 1872 and with numerous expansions added on over time, holds literally hundreds of rooms on its two floors, containing thousands of art pieces from across human history and around the world, covering virtually every field of art in existence. Along with the numerous permanent exhibit halls mentioned below are several changing exhibit halls. The first floor holds the American Wing, with period rooms and decorative arts from the 19th and early 20th centuries; the Arms and Armor hall, with suits of armor, swords, guns, and other arms from around the world; Arts of Africa, Oceania, and the Americas; Egyptian Art, regarded as the finest collection of Egyptian works outside of Cairo, which features the Roman Period Temple of Dendur; European Sculpture and Decorative Arts, with numerous period rooms and Renaissance sculpture; Greek and Roman Art, with numerous examples of classical sculpture, vases, and bronzes; Medieval Art, featuring a cathedral-like room with numerous Romanesque pieces; and Modern and Contemporary Art, showcasing the works of some of the most famous artists of modern times, such as Balthus, Boccioni, Bonnard, Matisse, and Picasso. The second floor holds a continuation of the American Wing; Ancient Near Eastern Art, showcasing some monumental Assyrian reliefs and statues; Chinese Art, which holds some exceptional Buddhist sculpture, jades, calligraphy, and period rooms; Cypriot Art, with ancient art from Cyprus; European Paintings and Sculptures, with masterworks from Cezanne, Monet, Renoir, Rodin, Van Gogh, and numerous old masters, including five paintings by Johannes Vermeer, the largest collection of Vermeers in any museum in the world; an extremely comprehensive Islamic Art collection, Japanese Art, with numerous prints and textiles; Korean Art, a continuation of the Modern and Contemporary Art halls; and South Asian Art, with works from India, Pakistan, Nepal, Tibet, and Southeast Asia. A note on prices: you can pay what you wish if anyone in your party has valid New York State ID. If you're visiting with locals, have them get you in! The Reservoir area spans the area of the park from the 86th St Transverse Rd to the 97th St Transverse Rd. The North End spans the area of the park from the 97th St Transverse Rd to Central Park N.
Being the only large green space in such a densely populated area, Central Park is an extremely popular place for outdoor recreation. It's also a very pretty place to get outdoors, and you'll join numerous other New Yorkers as you explore the greenery of the park and take in views of the surrounding cityscape. Shopping is central to New York culture, and a visit to Central Park still affords tourists an opportunity to browse and shop distinctly New York products. Vendors and seasonal markets set up shop in ‘’’Columbus Circle’’’, including a winter holiday market that has artisanal products and great food stands for noshing while shopping. Throughout the park are food and souvenir vendors, as well as artists selling their goods. There are a few notable shops that visitors will want to check out during their visit to the park. Manhattan is a Mecca of food offerings. From world-famous pizza to exotic offerings, the city offers culinary delights to satisfy everyone. While many travelers are aware that the city is a haven for food-lovers everywhere, what they may not know is that the famous urban oasis, Central Park, has its own unique set of tempting eats. There is little that's as quintessentially New York as its hot dog and pretzel vendors. Approximately 40 pushcart vendors, each one selling these iconic eats, can be found scattered throughout the park throughout the year (weather permitting). In addition to hotdogs and pretzels, these vendors typically offer water, soda and occasionally extras such as chips or ice cream. Pushcart vendors are highly regulated by the city. They must purchase a license (costing upwards of $250,000 a year for a prime spot in Central Park) and the amount they can charge customers is controlled by the city. Kerbs Boathouse Cafe (east side at 74th St.) offers visitors light snacks and full use of their restroom. Central Park Zoo (64th St. and 5th Ave.) visitors can grab a bite at Dancing Crane Cafe. This café offers everything from snacks to complete, fresh and healthy meals. In the winter, stop by Wollman Rink (east side between 62nd and 63rd St.). Their snack bar offers hot beverages and a variety of snacks to be enjoyed while watching the skaters. Those visiting Central Park anytime from March through November can hit Ballplayers House. Located mid-park at 65th St. (next to the carousel), this small brick café offers a charming spot to sit and munch down a hamburger or sandwich. Vegetarians, and lovers of Mediterranean street food, should head over to the Maoz Vegetarian concession stand (at the Harlem Meer, upper east side from 106th to 110th St.). Central Park also has three full-service restaurants. Its most famous one, Tavern On the Green (west side between 66th and 67th St.), opened in 1934. Its menu features local, seasonal ingredients. Loeb Boathouse (east side 72nd St.) has two dining options. The Lakeside Restaurant serves lunch and weekend brunch year round, and dinner in the spring, summer and fall. The Express Café is open daily year-round, and serves traditional breakfasts, burgers, soups, chili and salads. Le Pain Quotidien (west side of mid-Park at 69th St.) is a European café with both indoor and outdoor seating. Its offerings consist primarily of organic, healthy meals and treats. 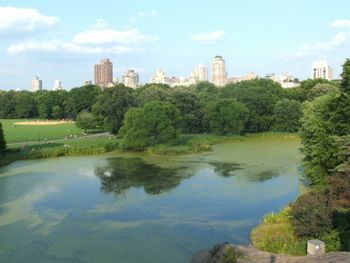 Central Park has unbeatable views, and a couple of bars in the park let visitors enjoy nature with a drink in hand. While there are only two places actually inside the park that offer drinking, summer park festivals, like the New York Philharmonic Orchestra's Concerts in the Parks sometimes offer alcoholic refreshments. There are also a number of bars and hotel lounges surrounding the park that feature views of the park and the Manhattan skyline. The restaurants within the park have predominantly daytime hours, and reservations are highly recommended. Bars in the surrounding neighborhood have traditional late-night hours for a drink after exploring the park. It is illegal to sleep overnight in Central Park. A great variety of accommodations, from hostels and budget hotels to really ritzy places, are located in the adjacent districts of Midtown and the Theater District to the south and the Upper West Side to the west. This page was last edited on 27 March 2019, at 18:08.